Blended whisky is the main volume driver of the scotch whisky industry but still carries a stigma that has proven challenging to shake. The history of blended whisky is the history of the Scotch whisky industry as a whole (see my Bullocks to Blends post from 2008) and for over a century some of these whiskies have been the strongest brands in the world. For ten years, John Glaser has been insisting that it is time for the world to take a fresh look at this style, "and that is why we have created Great King Street." The bottle clearly states a few keynotes of their malty manifesto in a Georgian press-style look and feel with terms like "artist", "non-chill filtered" and "natural colour" all making an appearance. The tube quotes Aeneas MacDonald's assessment of the styles of whiskies that appeal by geography, pointing to the central role for blended whiskies on a global level 80 years ago. The ambitious ideology is laid out on the website: "More than just a new brand, Great King Street is a mission, a mission dedicated to reviving interest in one style of whisky only: Blended Scotch Whisky. This is the style of Scotch whisky that combines flavourful single malt whiskies with delicate, elegant single grain whiskies." So the tube tells us Great King Street is "The rebirth of the blend." Ambitious. Today, blended whisky is a price-driven category in most markets globally, as Compass Box is no doubt aware. So if they see a "rebirth", the labour is due to be a very long a drawn out process for John and his Compass Box team. TAKE THE EPIDURAL! For all Compass Box had on the mission, click HERE. Fresh pastry, juniper and lemon. Youthful and assertive. Spirity, tart apples, and pencil shavings. There is a mineral note throughout with a gristy, malty, new-make-y zing. I hate that this is happening. I tasted and tasted again over several days (hard work, yes), but I do not share the exaggerated enthusiasm for this whisky that so many of my friends and peers have shown. 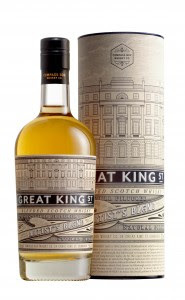 It isn't just that the flavour of Great King Street falls flat for me, its also the "house" context; every previous release from Compass Box I have really liked or even, on a few occasions, absolutely LOVED. What makes it especially hard is that I deeply respect all that CB has done for whisky blending as a esoteric category within an esoteric category, building consumer understanding of the idea that blends are NOT poor cousins to malts, older isn't better, dark colour is not a sign of quality, etc. And it's why the literature around this release puzzles me so greatly. By propagating the myth that high malt content equals higher quality blended whisky not only does it seem that they undermine their mission to have respect reborn for the blend, but it seems to go against what I think CB has been about for a decade. And if this is for mixing into cocktails, how does it rejuvenate the blend? Could gin or vodka do the job? If it is for rocks, then I also don't get it as for me it gets even more gin-like with juniper and spice essences of enhanced grain spirit and less like whisky with ice. Have not yet tried as highball (with soda water). Finally, at £50 a litre, I would go home with a bottle of Johnnie Black and a Grouse. Or Black Bottle. Or Grant's. Or, indeed, Compass Box Asyla. Good read. It underscores just how much personal preferences (even among the most ardent whisky fans) can differ. I approached this one with some caution. I was excited about the "mission" CB had taken on and hoped I'd still enjoy it and that it wouldn't feel "lesser" than some of their other stuff. I also hoped that it wasn't just all marketing the "cause". After tasting it, I think they executed well. It was much richer and lusher than I expected it would be. Not particularly complex but certainly round and full in flavor. It's fruity and has a great mouth feel and body. I do agree that having Asyla at close to the same price makes the decision for which one to purchase a little more difficult. To your point, I also agree that if the malt's the star here (and it is) does that defeat the purpose? Well maybe, but the grain definitely makes its present felt. It lightens things up and dresses the malt down a bit. It may not be a grand slam home run, but it wasn't intended to be. It's just well made, tasty, and unstuffy blended scotch. A diffrent opinion Sam, and a good one. I quite liked this one. being a blend i was not expecting much, but this is far better than JW... or the grouse. IMHO.